POPGUN 4 – new web banners and the order code! Posted on November 30, 2009 by D.J. Here are a couple snazzy new POPGUN 4 web banners PLUS the cover web banner with the Diamond Order Code (DEC09 0379, by the way) from PREVIEWS — which you can give to your fine Local Comic Shop to make it easier for them to pre-order you a copy! POPGUN 4 cover by Ben Templesmith — revealed! Posted on November 16, 2009 by D.J. Big goings on over the weekend! 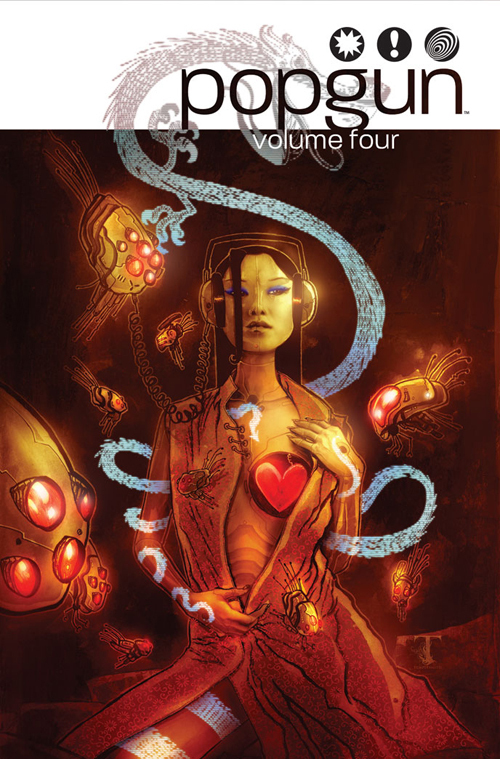 On Saturday, Rich Johnston at Bleeding Cool broke the news that Ben Templesmith is the cover artist for POPGUN 4, and it is indeed a glorious cover! Then, on Sunday, Mr. Templesmith posted a very cool blog showing his process in the creation of this gorgeous eye candy! It’s an interesting read filled with some great images showing the development of this image. Wonderful stuff. And the POPGUN 4 site (courtesy of web guru Tim Daniels) is live! On it is a complete list of our wonderful contributors (including Jeffrey Brown, Jock, Erik Larsen, Thomas Scioli, and nearly 80 more talented folks) plus FIVE FULL COMICS FROM POPGUN 4 — FOR FREE! POPGUN 4, a full color 512 page behemoth of a comic anthology, will hit shelves courtesy of Image Comics on 02/10/2010. Ask for it at your local comic shop or bookstore to order it! The Diamond order code will appear along with a snazzy solicit in the December issue of PREVIEWS! I’ll be posting more on this as we get closer to the release date. All of Team Popgun is very excited! If you’re a fan of previous volumes, this one is the biggest and best yet, so please help us spread the word!